Every year Microsoft holds its DreamBuildPlay contest to promote the XNA Development Kit on the PC and Xbox 360. The contest allows independent developers a chance to showcase their best work and enter for a chance to win some great prizes - including a publishing contract. We had a great tip from a member about two upcoming entries that feature cooperative play in a unique manner. Band of Bears is the first title mentioned from developer Cellar Door Games. As soon as you start the video you'll get a Castle Crashers vibe, but you'll quickly see the game has a lot more to offer. Instead of being a straight up hack and slash, Band of Bears combines puzzle solving elements with action elements. 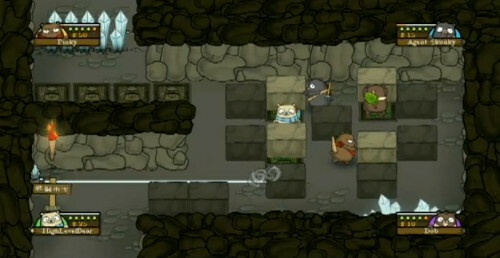 Sporting some slick hand drawn visuals, Band of Bears will have four player co-op. The really unique feature that the game offers is called the B.E.A.R.S. system. Bear Effort Adaptive Room System will dynamically alter enemies and puzzles so they are solvable by the number of players playing the game. Think of it like an advanced version of what Splosion Man does with switches in the co-op mode. The next game is called Duality ZF from developer Xona Games. Duality ZF is a SHMUP game with a unique twist. While the game does provide co-op play for up to four players, it allows each player to control two ships at once. What does that mean? Prepare for some serious on screen chaos as 8 ships and thousands of bullets fill the screen. Duality ZF will feature six different gameplay modes, and every single one supports the 8-ship/4-player co-op mode. The game also promises to support online leaderboards for each mode, so you'll be able to build a kickass team and dominate the leaderboards. The DreamBuildPlay contest for 2009 is currently closed, and winners will be announced in September. Good luck to both of these games! Thanks to Teddy for the tip!